Heaven's banished Angel and Hell's worst fear returns in the second short story of author David White's MaGee, a Pro Se Single Shot Signature Series from Pro Se Productions. It's been a rough year for MaGee since his defeat of the Hell Knight, one that has found him going into business for himself. And one client comes in that might be the death of him, or the death of anyone else. 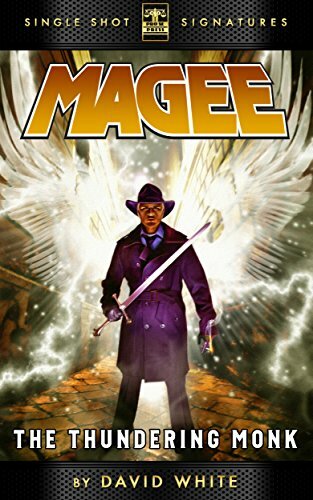 Recruited to find an old friend lost and tricked by his own kind, MaGee finds himself fighting evil on the streets of Chicago and in the fields of Asgard. Can a wingless angel who enjoys his scotch survive one of the most classic mythological family feuds of all time and return the lightning to its rightful owner? Find out in David White's MaGee: The Thundering Monk. MaGee Book Two: The Thundering Monk features atmospheric cover art and logo design by Jeff Hayes and eBook formatting by Russ Anderson. The second short story in this fun supernatural Single Shot Signature Series is available for the Kindle via Amazon at http://tinyurl.com/kfr3enk and for most eBook formats at www.smashwords.com for only 99 cents.